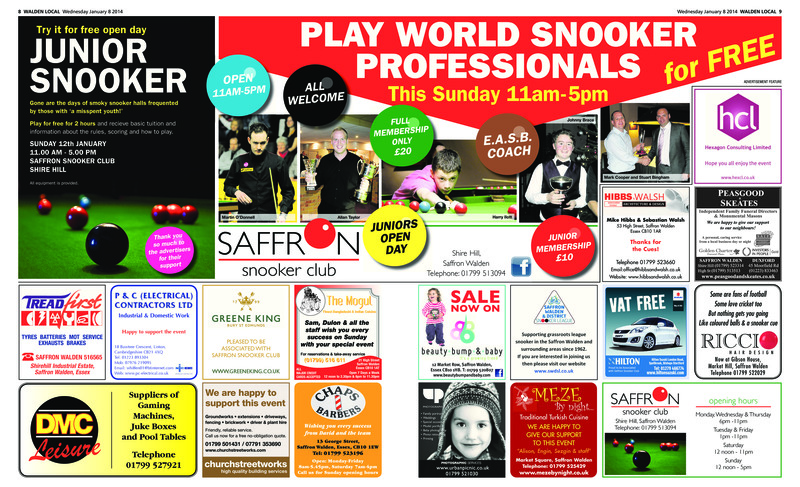 To encourage the next generation of snooker players, Saffron Snooker Club will be holding a free Open Day for Junior Snooker this Sunday 12 January 2014 between 11am and 5pm for all budding young snooker players to come along a try the sport for the first time in a friendly and family orientated environment. An EASB qualified snooker coach (Russell Huxter) and two current world snooker professionals (Allan Taylor and Martin O’Donnell) will be on hand to help give guidance with basic technique and explain the rules. All equipment is provided by the club, you only need to bring yourself! Please see poster below for further details which appeared in this week’s Walden Local newspaper, or alternatively you can contact Mark Cooper on 01799-513094 or via email saffronsnookerclub@btconnect.com. The club has an excellent bar area where parents can sit and relax and enjoy either a beer, glass of wine or a selection of soft or hot drinks whilst the juniors are on the green baize. Food is also available. The address for Saffron Snooker Club is 2 Shire Hill, Saffron Walden, Essex CB11 3AQ. We hope to see you on Sunday!